Can roasting be a purely economical pursuit, or does it need to be a passion also? Thread: Can roasting be a purely economical pursuit, or does it need to be a passion also? Build your self a Corretto for a fraction of the price and roast batches of up to 750 grams, you wont regret it. A lot of info here https://coffeesnobs.com.au/home-roas...ts-pics-5.html unfortunately a lot of the links no longer work. This is my setup, have been successfully roasting with it for many years. coffeechris and DaveD like this. 4 KG per month consumption is a good reason to get into home roasting but it requires alot of attention. If you plan to multitask while roasting, forget the whole idea. In purely economic terms, you are probably saving between $20-30/kg (or $20-$30 per week) on beans. You'll need to do at least two roasts with the Behmor. If you are organised, you will need around 30-45 minutes per week. It comes down to how much you value your time and whether that 30-45 minutes is worth $20-$30. Given green beans sourced from BeanBay are around $15p/kg (roughly factoring in postage costs to that average), the remaining costs are the cost of your roaster divided into the usage + associated running costs (i.e. electricity) + your time as a cost. Balance the above against the $50(ish) p/kg you would pay for roasted specialty coffee (assuming that’s your thing). Personally my my time is not a factor as I love roasting coffee, therefore it is most definitely an economical gain for me. For me I was in a very similar boat. Yes it’s pretty easy. If you are looking for that last 10% and want to experience all the flavours profiles etc. then no it won’t be easy. I can do my roasting for decent coffee whilst the fiancé watches an hour show once a week. That works out to 800g a week roasted. I think like anything coffee related if you are always wanting and pursuing that last improvement then roasting can be more time consuming but it can also be a quite easy set up. I use the behmor for reference. No need for an Excel spreadsheet, all that is needed is a Digital Multi Meter and a watch, and, perhaps the ability to remain focused. Javaphile, simonsk8r and 338 like this. Once again there is a need to be hooked up to a PC, for the sake of simplicity, not my choice. I get the feeling that you want a roaster that’s going to be easy to use and not require too much attention while still giving you a consistent result. The Behmor isn’t particularly difficult, but it still requires virtually all your attention for most of the time you’re using it. Any less and you could see problems ranging from really variable results, to the dreaded err7, to a fire. (A Coretto is even further down the DIY/hands on track). The only roaster I know of that does what you want is the Sonofresco. It’s 10 times the price of the Behmor so it’d take a lot longer to make your money back, but it can be used time after time and will deliver much more consistent results more easily. Do you know anyone that could go in with you on purchasing one? 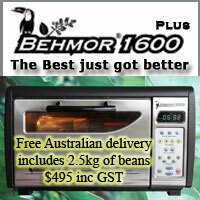 For me the price of a behmor and the 2.5kg of beans its a great way to see if home roasting is for you. if in a few months you say its nor for you id think you havn't lost too much money if you sell it. I wasn't sure and now i love it, its my 1 each week of peace, wife doesnt argue as wants her coffee! There is a simple way to use a Behmor and from memory is as follows. Load with 350-400g of greens, use P2 profile, wait for first crack and then push P2 (manual to 25% power) and push 'C' to change timer to 3.10 minutes, let it cool (12 minutes?) and done. Ah yep, well I think I started out primarily to save money, then I really started to love it! It just further my passion and learning everything coffee, really was an awesome step in my journey, and opened up a whole other world. I guess the answer is it depends! It takes a little effort, but if you really don't want to get into being fully in control of every facet, you can always use the automatic profiles on the Behmor. I did for many years and had great results. To be honest it really was almost a set and forget. I did even leave the roaster in the early stages of the roast (even though it was highly not recommended!). I don't think it would be a major chore. For me, today I spent about 3 hours (I take my time , it used to take about 2 hours for 4x350g roasts when I was more casual about it) or so roasting up 1.4kg of beans (1.1kg roasted beans or so, in 4 separate roasts). Spent some beautiful time outdoors, and had a ball. For me a kilo lasts about 3-4 weeks, so obviously you'd have to roast alot more. But auto settings wouldn't require as much recording etc (I still would record a few things). I actually think the Behmor is designed to be a good solid, reliable, simple roaster that isn't a big chore (not that others are bothersome! ), especially the auto settings. But you can always take it to the next level of roasting with it like many and myself have. I remember Andy posting here a while ago that he just set and forget a Behmor, using one of the preset profiles, roast after roast after roast and each and every result was great in the cup. Javaphile and simonsk8r like this. It’s easy and fun. And like mentioned above, if it’s not you , you can resell at minimal loss. I started with a simple Corretto - just my watch and eyes to gauge what was happening. Refined it incrementally with roast monitor, lids, cooler etc. Now use the Behmor , far less McGivery but still fun. Cleaner and simpler. Can be slack on auto or play around. Even the roasts I have stuffed up have tasted decent. The Behmor you could do the auto profile, set times for the countdown so you don’t miss it, press c at first crack and 25 or 50% manual depending on ambient temp and how dark you like it and the roast will be 95% great. You can’t set and forget but you can do other things while it’s doing its thing if you are nearby. Dimal, greenman and simonsk8r like this. There’s some valid points above and I agree that the Behmor is cheap enough that it could be worth a try. Give it a go for a month or two and if you decide you don’t like it you shouldn’t lose much money in selling it. It’s not quite ‘push button’ simple and there’s a little bit of prep at the start and tidy up at the end, but it’s not too horrendous. There’s plenty of advice on the forum for using it and plenty of people willing to help too. greenman and mjoyce like this. ''It’s easy and fun. And like mentioned above, if it’s not you , you can resell at minimal loss. I concur with Artman, the Corretto is an inexpensive and wonderful way to get into roasting. The hands on process, watching the little signs of colour change, smoke starting to appear at crucial stages, listening the first and second crack etc. A great way to learn about roasting without breaking the bank, and amazing coffee to enjoy--go for it~~~!!! I would say that for me 80% of the reason for a Behmor is economics and 20% is for the fun of roasting. I would use auto profiles 80% if the time, and I do set a timer and walk away from the machine once the roast is up and running. I do still check it a few times during the first 13 minutes (for a 450g roast), then once it’s up to the business end of the roast I set a timer to beep every 30 seconds so I can sit next to it and not be too distracted. I would also go through about 4kg a month. It’s definitely paid for itself over the course of a year. Once i'd done the calcs on the behmor it was a no-brainer. Paid for itself in 6 months, when I factored the wife's habits, and roasted filter for work consumption. If you've got the freedom and time every weekend or two, go for it. I found when I'm only half paying attention it inevitably cost me a failed roast, so I really had to put the time aside and at best sit in front of the roaster with a book. But on good days I was busy taking notes and giving it 100% attention. Those days make it worthwhile, and the great variety of beans available on the beanbay. Dr_Dave, greenman, simonsk8r and 3 others like this. I roast 200g batches in my 1600 - I sit in my shed/workshop and check my business email, social m and then dump my beans into a spare hopper. This gets used in a couple days or so. I only roast coffee for V60 and Brazen so it doesn’t require much planning. I think you've summed it up pretty well. As long as you follow the usage and maintenance guidelines it will serve you well. Allow the recommended time between roasts and don't roast on really hot days. The electronics in the Behmor will thank you with a long service life. If you look after it and decide in a couple of months its not for you, resale won't be an issue. If you do go down the Behmor path one tip I'd give is don't overdo the bulk buying of green beans! They store reasonably well when looked after but they do age. I've always had the best results from my most recent purchases. I roast in the kitchen under a Rangehood backed up by a ceiling fan with windows and front door open yet still get a roasting "aroma" through the house. It doesn't bother me that much but occasionly on hot days there is a reminder that roasting has occurred. The last 1/3rd of the roasting time is the most critical as far as paying closer attention. The Behmor also needs reassurance that you are watching with user input required at around 75% through the roast. The Display blinks and a 30 sec countdown begins during which you need to press START to continue. If you miss this input, cooling will commence and the roast won't be complete. Dimal, simonsk8r and CafeLotta like this. Personally I find it both economical and therapeutic. I love to grab a beer and head out to the man/coffee/bike cave/shed, roast my coffee and enjoy the solitude for an hour or so. Once a fortnight a kilo of green and I’m good. Congrats mate! Very exciting times ahead . You'll love it I reckon, it's a very relaxing activity. If it's the middle of winter and the ambient air is cold then substitute P2 manual for P3 manual. This is the same technique I use on the Behmor roaster when doing demos at trade shows. Simple, successful, repeatable. Hardly mentoring, but it does work well as a starting point for just about any arabica bean, make adjustments to the process to suit TASTE. Every year (and again this year) the Behmor wins most of the home roasting medals because in a blind taste test... it wins." Dimal and Celts88 like this. Well done! Lots of info here on CS re: roasting using the Behmor. Different Green Bean Varieties will have their own characteristics and requirements for roasting. If it hasn't been mentioned already, one of the best to start with and get a feel for things is the Peru Ceja de Selva. Roasts evenly with clear audible indicators of 1st and 2nd Crack. Not too shabby in the cup also.